Veeam® Explorer™ for Microsoft SQL Server offers you fast, transaction-level recovery of SQL databases. Without needing an extensive SQL background or having to search for database and transaction-log files, you can quickly perform point-in-time restores of your Microsoft SQL Server databases — down to an individual transaction — achieving recovery time objectives (RTO) and recovery point objectives (RPO) of < 15 minutes. Choose the desired restore point and add your SQL server backup to the scope. Get an at-a-glance view of your SQL server hierarchy including all instances, databases and their properties. Recover your databases to a precise point in time in just one click. 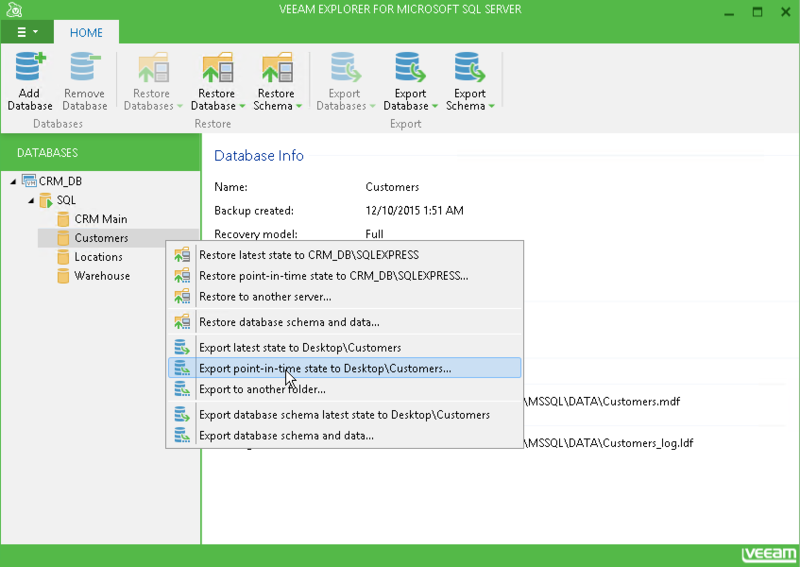 Veeam simplifies SQL Server recovery by providing you several options for restore. From a single image-level backup, you can restore databases or tables and you don’t need to be an expert or know what MDF, NDF and LDF files mean. The wizard-driven recovery process will guide you through, detecting all available databases and instances that you can restore, without having to search database and transaction-log files. Veeam® Explorer™ for Microsoft SQL Server is available in all editions of Veeam Availability Suite™, Veeam Backup & Replication and Veeam Backup Essentials™. It is also included in Veeam Backup & Replication Community Edition and can be used in conjunction with Veeam Agent for Microsoft Windows. Don’t pay for Microsoft SQL recovery – try this FREE tool! If you’re going to restore, especially in a DR situation, you’ve got to have 100% confidence in your availability solution. It has to work every time. Veeam provides an insurance policy for availability. Veeam helps us maintain business operations 24x7, and with that comes a high level of trust. Instant VM Recovery and Veeam Explorer for Microsoft SQL Server have saved the day for us.